Elle: So I liked our pattern of doing one Half Ironman a year. And I really enjoyed Challenge St. Andrews. And since so many people talked about how they really liked this race, we decided to do the Patriot Half. Webb: I was persuaded. For me, it was supposed to be the commitment that kept the off-season from becoming too long. We signed up in October and before you knew it, winter laid upon us like a heavy, cold, frozen blanket. Not making excuses, just telling it like it was: there was infrequent and inconsistent training in the Triathletes Journey household from December through a good portion of February. Webb: We arrived early at the race site to grab a preferred parking spot near the transition area (TA). With plenty of time, low expectations and some good planning, we took our time making our final preparations before heading to the TA to rack our bikes and set up our gear. Webb: On this day I purposefully resorted to the old ways of using the swim as my warm-up. For one, I was not feeling particularly strong going into the race event. Second, in the 4-6 weeks prior, I had developed some serious soreness in my right shoulder that kept me out of the pool. I had no idea how it would react. I decided to drop any goals and just swim nice and easy. That same lazy attitude led to some early tense moments. I took my time getting into my new Roka wetsuit. Elle zipped me up and we started making our way over to the swim start. There were a number of people exiting the swim warm-up area where I also noticed a small pack of swimmers heading out in haste. I asked Elle, "Is that the first wave?" Uh oh, I was in the second wave. I had to hustle. Luckily, race management (i.e., Sun Multisports) was continuing an experiment where each wave sent off three competitors every ten seconds. That gave me the extra time I needed to zig-zag through everyone to jump on the back of my wave. I really like this format. Being able to swim free of a pack was exactly what I needed to have some confidence with my shoulder. It was sore from time to time but held up fine for most of the 1.2 miles. Thankfully, I did not have to jockey for position or alter my stroke to navigate a crowd. As it was, I ended up only swimming about 2 minutes slower than my normal half-iron distance pace. Elle: I started my swim about 15-20 minutes after Webb. I was excited to try this new 3-at-a-time start. Granted, I don't have a problem with the group start, I oddly like the insanity of it. But this was good too. Now to the bad news: I felt my extreme lack of swim training, and struggled a bit. OK, a lot. Note to self: stop skipping swim workouts! 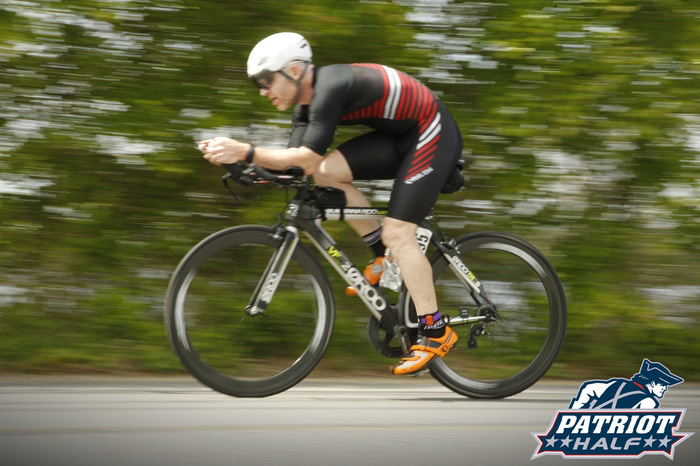 Webb: The bike is a fast, New England flat course, meaning, rolling hills without any hills that are difficult. Let's be clear though that flat in other parts of the country means no hills. It is also not a particularly technical course. There are about six turns in the first couple of miles and two hard right turns that warrant caution. Other than those it is a great course to settle in and drive a steady effort. My plan for the bike was to take it easy on the first lap and just go with how I felt on the second lap. Since the training was not there for this race, I wanted to ease into each leg and try to negative split. That was not going to happen. Right out of T1 I paired up with another guy and we began working together. I knew it was not sustainable but I was having such a fun time. About 15 miles in, I decided it was a really bad idea because I could ruin my whole day. I let him and another guy who had joined us pass. Soon enough I had caught them again as they had come up on six guys riding questionably close. I hung back, sat up on my saddle and moved the left to catch some air so I would not be drafting. Frustrated, I dropped the hammer and attacked, passing all eight guys. That took a lot out of me but I figured if we caught those guys to begin with, they would not follow suit. My race buddies passed me and I was happy to let them go. Within a few minutes, the six hangers-on came racing up and fell in line between me the guys up front like we were doing a team time trial. I attacked again. Hard. It worked; we finally dropped them. It took its toll though, as I needed a few miles to recover. Elle: As usual, I was just really happy to be done with the swim. We had done a couple of practice rides on this course before, so I knew what I was in for. And things were going A-ok. Alright. I'll just cut to the chase here. At the first bottle exchange (around mile 18), I was ready for some more water. So I grabbed a bottle and started to pour it into my handlebar-mounted water bottle, as I've done before in other races. No big deal. But then, all of a sudden, catastrophe hit. Like a brick wall. All of a sudden my biggest race fears were realized as I found myself, seemingly for no reason, flying over the handle bars of my bike, diving head-first into the pavement. What I do remember with clarity is the suddenness of it all. I remember the distinct feeling of pure dread and fear as I felt my body hurdling toward the earth with force, unable to stop, knowing that what was about to happen would be bad. And I couldn't do anything about it. "Is, is, is, MY BIKE OK???" Eventually they moved me off the road and into a chair. Then things are a little fuzzy, but I recall people doing some superficial cleaning/treating of my wounds. And people talking to me. They wanted me to go to the hospital. I wanted to keep racing. They asked me if there was someone I was there with. I gave them Webb's full name and race number. I was told that I was disqualified because my helmet was not longer regulation, since it was cracked all the way through. Crap. And as I refused the option of going to the hospital, I distinctly remember one woman saying, "If you could see yourself, you'd want go to the hospital." But at this point, I was just so emotional about the idea of not finishing the race, I wasn't thinking rationally. Finally an EMT convinced me to get in his van and go back to transition, since I had to accept that my race was over. I can't tell you how devastated I was by this. My emotions regarding not finishing the race were overriding the clear physical problems that my body was trying to broadcast. One of them being that I couldn't stop shaking. My whole body was just shaking, and it wouldn't stop. Webb: Elsewhere, I had intentionally and considerably slowed down for the second lap, unaware of the drama unfolding. 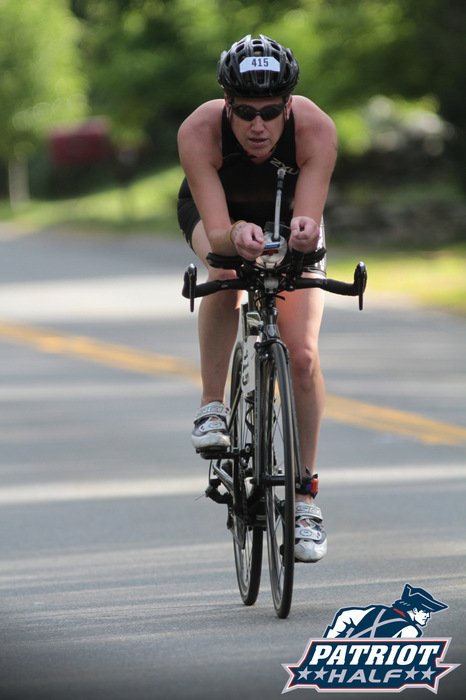 Webb: The transition to T2 was painfully long, running with my bike in my shoes was difficult. This was the first time I had wished I learned how to transition keeping my shoes in my pedals. I think it would make it a lot easier. She could not have passed me on the bike. I don't know, that second loop felt really slow. But there is no way; she started 15 minutes after me! How slow was I going? Oh no, I hope she's ok. Did something happen in the swim? No, no, no, that is too unlikely. She wasn't feeling great this morning, maybe she abandoned. Maybe I should check? Don't overthink this. If you don't go out and run and she is hanging out, yucking it up, making the best of a bad day, she'll just feel bad. Just get this run over with. Elle: So I got back to race headquarters. The nice EMT guy pulled my bike out of the van. And a race official was there, ready to take my timing chip. Again, this was a very emotional thing for me to do. The final, "Yeah, your race is f*cking over today" moment. Again, they asked me if I was at the race with someone, and I gave them Webb's info. Then I walked my bike over to the EMT truck, because I said I would. The guys there tried to get me to go to the hospital, but again I resisted. At this point, the most acute pain I was feeling was in my calves, from stopping so abruptly after intense stress, the muscles in my calves had seized up. So I headed to the next tent over (the massage tent) to see if they could do something about it. The race was still going on, with no finishers yet, and they had nothing to do, so they told me to lay face-down on the table and they started to rub my calves. It wasn't even 60 seconds in before I started to awkwardly sit up and mumble, "I don't feel so good". I was getting nauseous and dizzy. "I feel kinda nauseous..."
"She's only going to get worse..."
And the EMT's were now pressing me harder about how I should go to the hospital. "We can't force you to go, but based on your vital signs, we HIGHLY suggest that you go to the hospital. Now." I wasn't feeling good at this point, so I finally relented. With the simple utter of, "Ok, I'll go," before I knew it, I was strapped onto a gurney, and was in the ambulance on my way to the hospital. Webb: We did not preview the run course at all. I had no idea what to expect, other than it was a single 13.1 mile loop. Right away I was feeling fatigued. The first few miles were marked by rolling hills. I struggled from time to time wondering what was up with Elle, which was actually a really good distraction to my shuffling, tired legs. Three miles in I actively tried to push thoughts about Elle and running out of my head. I started counting steps: 1, 2, 3, 4, 5, 6, 7, 8, 9, 10, 1, 2, 3, ... You get the idea. It worked like a charm for the next four miles. Between miles seven and eight, I stopped being able to count. I considered asking aid station volunteers to see if they could get on the radio and find out about Elle. I figured it would be easy to say, "Hey, I'll be at the next station in about 10 minutes or 20 for the one after that. Please send word ahead." I did not do that. Hindsight still doesn't tell me if that was the right non-decision. 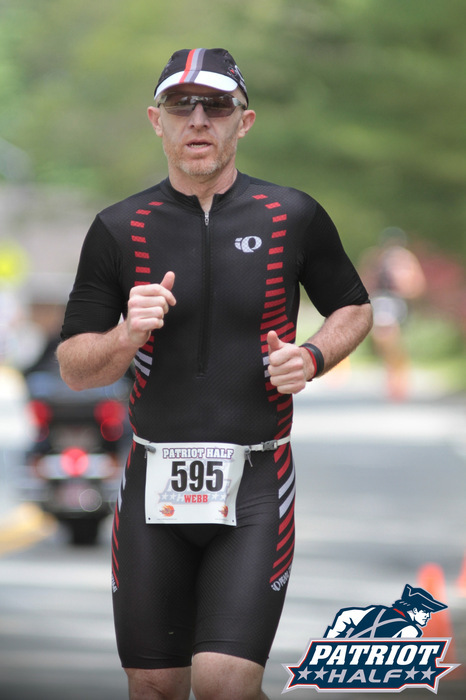 All I had in my possession was the race suit I was wearing (a skin-tight onesie), and nothing else. That was it. I didn't have a cell phone, a wallet, ID, or even shoes. In fact, they had to give me hospital socks so I could use the bathroom. They told me they'd pay for a cab to take me back to the race site. Standing on the sidewalk in front of the hospital. In my race suit, and nothing else. Wondering if Webb had any idea of where I was or what I had been through. The cab finally showed up, I climbed in, and we headed back to the race site. Webb: I crossed the finish line and went straight for an empty chair that I spotted in the shade. I drank water, ate a banana and began searching the finishing area for Elle. When I didn't see her within the first minute, I knew something had happened. If she had abandoned for a minor reason she would have met me at the finish line. I struggled to stand and made my way to the TA to check out her area. I saw all of her stuff still undisturbed. That was unsettling. I grabbed my car keys and headed towards the car to check my phone, thinking she would have found a way to contact me. As I was walking down the 'Run Out' chute, I overhead a man say, "I'm trying to find this guy to tell him about his wife." Me: Excuse me! I'm looking for my wife! Race Official: Are you number 595. Race Official: Your wife is okay. (oh I don't like the start of this.) She crashed and hit her head. She is at the hospital and she's fine. Me: She's at the HOSPITAL??? Race Official: Yeah, she's fine. She wanted to keep racing. (that sounds about right) But we disqualified her because her helmet was cracked. Race Official: Yeah. She was ok, but the EMT's wanted her to go the hospital. You'll need to go pick her up. Race Official: She is at St. Luke's. Me: Okay, thanks! (Do I know what town I'm in?) Wait, where is St Luke's? I thanked the Race Official and headed down the chute towards the car. She must have tried to reach me. I need my phone. Elle: I finally reached the race site, and I stepped out of the cab, still in my hospital socks, not really knowing what to do next. During this whole incident, I had made a concentrated effort not to cry. I thought about Chrissy Wellington, who won Kona after a devestating bike crash just weeks before the race. And about Kathryne Bertine, a pro cyclist who has suffered much worse, and still raced. And about Chris Horner, who finished a stage of the Tour de France after a devastating crash, and didn't even remember finishing the stage. He kept asking, as he was being gurneyed into the ambulance, "Did I crash? Did I finish?" The strength of these heroic athletes circled in my mind and helped me to put my situation into perspective. And to keep me from crying. But as I walked (bare foot) towards transition, all of a sudden, I saw Webb walking towards me. And I couldn't keep it in any longer. As I approached him, we embraced, and a waterfall of tears streamed down my face. Webb: After skirting through T2 and running 13.1 miles telling myself not to worry and then listen to a race official tell me that Elle went to a hospital in another town, only to learn she had been "discharged," it was almost incomprehensible to see her walking down the chute towards me. How was that possible? And what relief to see her walking and looking no worse than anyone finishing a 70.3. I took a moment to acknowledge that despite how awful the crash was, I was grateful she wasn't lost and we didn't have to go through the anxiety of trying to find each other. Elle: You learn something from every race. Things don't always go your way. And when they don't, you need to find something to take away from that. It could have been a lot worse for me that day. It takes strength to remain positive and keep moving forward, but that's what I tried to do. 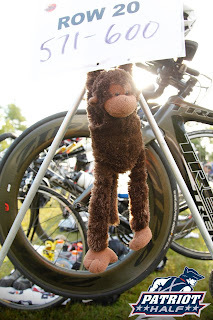 A lot of the experience of racing triathlons is the mental game. How do you react in the face of adversity? You can learn a lot about yourself in those moments. I'd like to think that I learned a lot that day.